It is unfortunate, and even a little disappointing, that there is no real equivalent to TankFest in the US. There are a large number of operating vehicles in the US, but they are scattered around the country, and in places where there are reasonable congregations, such as VMMV, they tend to not be at facilities which both allow for running of vehicles and allow a significant number of spectators to watch them. As a result, the best you are likely to find are localized events, such as local open houses and re-enactments. I have stated in the past my opinion on running historic vehicles. They are built to run, not just sit in a warehouse or museum gathering dust. Fortunately, it seems that the lads over at the Museum of the American GI are a group of folks who seem to generally agree with me on that score. Their vehicles run. All of them. You’ll see more of MotAGI over the next couple of months, we’ve a few more videos to come out yet. We filmed Pico’s Tank Academy there and some Inside the Hatch. This little piece that you’re reading is purely a review of a pleasant day spent in a field in Texas. MotAGI as much as possible believe in living history, and are enthusiastic supporters both of vehicle collections and re-enactment groups. Every year, usually March, they host an open house which also doubles as a bit of a regional collector’s get-together. One also can’t argue that they’re not centrally located: College Station is right in the Texas Triangle. It lasts over two days. Day 1 is really for the collectors, and is on a Friday. It is the day that they all show up, and then scour the sales stands for that gauge or pump that they need to finish the restoration of their vehicle. They can catch up, share tips and knowledge, and in the evening they have a slap-up dinner in the newly built museum structure. As the casual person just looking for a cool day out to take the kid, however (or the husband acting like a kid), you are probably far more interested in the Saturday events. Absolutely nothing happens until the mid-afternoon, though, so don’t feel too compelled to get out of bed at an unGodly hour: It is the weekend, after all! Better yet, you don’t even need to worry about parking. Just drive to College Station, keep going South on 6, and look for Santa’s Emporium. Or Winter Palace, or Wonderland. Or something. No idea quite what he’s doing there, but he lets the museumgoers use the car park. Take the bus or walk to the museum ground. The area was basically divided into four: Trade stalls, living history, vehicle displays, and The Battlefield™. Honestly, unless you’re –really- interested in this sort of thing (or want to buy a fixer-upper jeep), I can’t imagine your spending much time at the trade stalls. The living history section is a group of tents where re-enactors can guide you around. 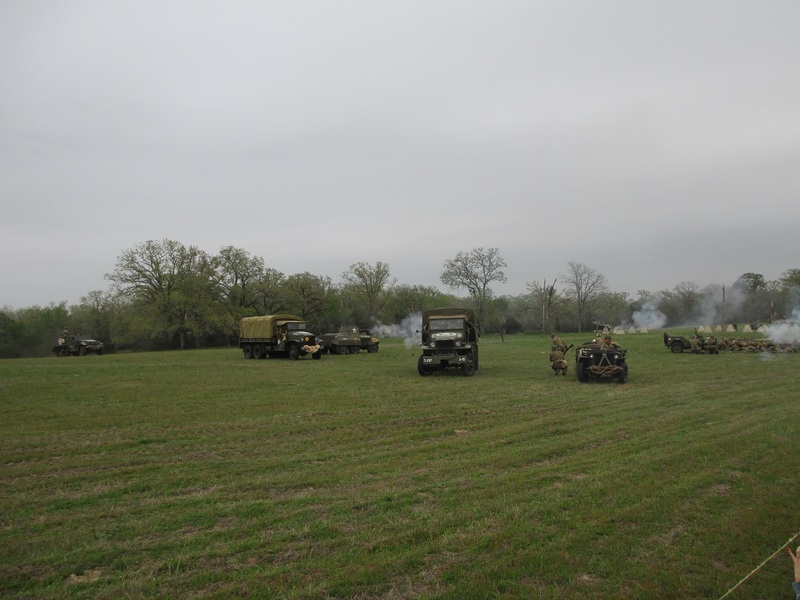 This particular event had the “Patton’s 3rd Army HQ” (Complete with a Patton impersonator) with an interesting collection of typewriters and radios. Now, I know that in WWII unit staffs were a smidge smaller than they are today, but I’m not entirely sure an Army HQ really fit in the one tent. But maybe it did. I probably should have asked. What you really want to see, though, are the vehicles. About half owned by the museum, and half brought in by other persons for the day. Generally WWII, though the occasional post-war one shows up from time to time. If you keep an eye out, you'll be seeing the various preparations for the upcoming battle. Blank ammunition being divvied out, vehicle crews receiving their briefings, weapons installations... By about 2pm the vehicles move out. If anyone knows of one of these going for a good price, let me know. I have half an interest in buying one for occasional commuting. The tanks line up, ready for the upcoming battle. First, however, a sales demonstration. Soldiers, the rifle. Soldiers, the tank. Soldiers, the flamethrower! The crowds line up, and the battle starts. (Slowly). A group of lost infantrymen run into a group of lost Germans, and away they go. Things don't get off to the best start for them, but help soon arrives. With light armour! More noise is added by the fire support, though when they ran out of ammo, they chimed in with the .30 cal next to the 105 there. I am suspicious that (1) it had the range, or (2) that if actually that close, they'd have really been firing through their own troops. However, maybe I'm just nitpicking. As the battle continues at a furious pitch, hark! What be that sound? It be two A3s and an A1 coming over the hill! And it's all over. The M4s assault through the German defenses and mop up. Home for cookies and the gal waiting patiently. Sadly, I must report that the match was rigged. I discovered that the plan was for the German side to lose all along. Apparently this is common and one would be foolish to ever bet on the Germans. I did inquire as to whether anyone had ever considered the possibility of letting the Germans win, it was responded that if that were proposed, the Germans would all have collective heart attacks with shock, and the Allies would win by default anyway. The despondent Germans, as they are walked away to captivity, detour for some World of Tanks. "Ah, if only we had our E-100, we would have ROFLStomped the M4s and M18s..."
It being now close on 5pm, it's time for everyone to go home. And that was it. So now, if you ever happen to be swinging by College Station next March for their open house, you'll have an idea as to what to expect. There are certainly worse ways to spend an afternoon.